1. Make initial contact and a good first impression. Before you can do business with a person, you must first make contact. During that first contact you must make a good impression. 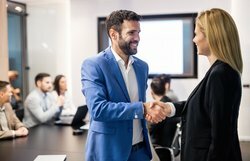 Making a good first impression is an important communication skill you should master, because only if they like you, will you progress to stage two. 2. Gain rapport and make an emotional connection. You need to build rapport with everyone you meet. Rapport is a feeling of connection, likeability and trust. Rapport is gained when you cause the other person to lose the natural caution they feel whenever they meet someone new. You must break down the emotional barriers between people and make a good connection with them. Gaining rapport is a business communication skill you should master. 3. Asking questions and listening with the intention of understanding, what the other person wants and needs. When you have rapport, you can get down to business, by finding out more about their needs, wants, and what they don't want. If you understand these, then you know which of your products and services will best serve their needs. Asking discovery questions and excellent listening skills are the next business communication skills to master. 4. Explain how your products and services will benefit them. Now you understand what they want, you are in a position to explain how your business can satisfy their wants and needs. The ability to make yourself clearly understood is the next communication skill you need to master. 5. To gain commitment to enter into a business relationship (close the sale). When they understand how you can help them, you need to persuade them to make a positive decision and to commit to doing business with you. Many of your prospective customers are afraid to make a decision (they are afraid to make the wrong decision), so you need to help them overcome their anxieties. This skill is called "close the deal" and you need to master it. Help people to make a positive decision, is another communication skill to master. 6. To keep contact with customers and grow the business relationship. Once you have started the business relationship, the next step is to keep it going, and to grow it to something more substantial. You do that by repeating the processes stated above. Contact, rapport, investigation of need, description of how you can satisfy their needs, close the sale, keep contact, build more rapport etc. Developing your ability to create and maintain excellent relationships will help you enjoy more success in every aspect of your life.